If Bose Audio were a car company, they would be the Rolls Royce. Bose is a trusted, timeless luxury brand of headphones, and the advanced audio technology they’ve developed over their 50 year history (ancient in the audio industry) shows in their incredible QC 15s which I have been happily using for a year now. Side note: Good to see we’re all alive on December 21st. Tough luck Mayans! When I look at a pair of headphones as a reviewer, I look at three main factors to determine the quality. I look at sound quality, comfort, and noise isolation. In all three categories, the QC 15s have exceeded expectations and proven themselves to be worth every penny I spent. The sound quality in the QC 15s can only be described as excellent. The bass is strong, and the audio is detailed. When I listen to the 12 Gardens Anthology of Billy Joel, I feel like I’m actually in Madison Square Garden, row one, seat one. The design of the headphones, and the build really do deliver good value. Once again, the good ol’ Quiet Comforts exceed expectations in the comfort category. I have a big head, and sometimes over-ear headphones don’t adjust large enough to comfortably accommodate my head. The QCs easily accommodate my bizzare head shape, and I’ve talked to several other owners who say they fit perfectly. The ear cushions are plush, and provide ample support. I’ve sat on eight hour plane rides without a single pain from wearing them. I also have large ears, and the giant cups (not as large as these massive Sonys) easily accommodate my ears. As I said earlier, I’ve worn these on long, long plane rides, and they work perfectly. Even before you turn them on, the cushioning on the earcups does a good job of blocking out a lot of the noise of an airplane, or a crowded coffee shop. For the really annoying noises, like a crying baby or the whine of an engine right out the window, there is noise canceling built in. Once you turn that on, you’re transported to a world of calm. One day I decided to write an essay with a pair on, and that was the first time I realized how much noise there was distracting me in my quiet home. The cushioning, and noise canceling can block out just about anything, but just in case you can still hear that annoying guy a row behind you, just blast the super-loud music. That will literally block out an air raid siren. So, in all three categories the QC 15s by Bose excelled, easily surpassing overpriced competitors such as Beats by Dr.dre. My bose have served me well for the past year, and as I board a plane tomorrow I can only hope that they continue to serve me this well for the next couple of years. 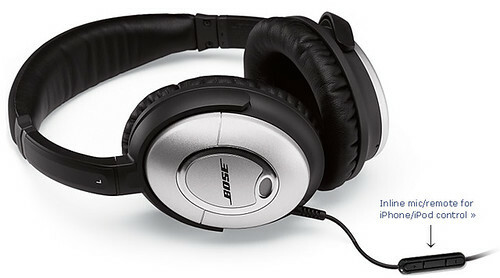 I highly recommend Bose QC 15s for any traveller than can afford them.